Back Volume Hard Copies available. OPEN ACCESS to Full-Text PDF files of Archives. 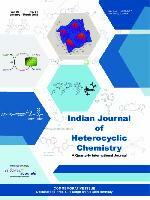 Indian Journal of Heterocyclic Chemistry is exclusively devoted to research in the area of heterocyclic chemistry. The journal publishes invited review articles and original research papers pertaining to structure and synthesis, mechanism of reactions, spectral studies, biologically active compounds, bio-chemical studies, physicochemical work, phytochemistry etc. ABSTRACTED and INDEXED in : Science Citation Index Expanded (Clarivate Analytics :Formerly - Thomson Reuters) ||SCOPUS Database (An Elsevier Product) || Chemical Abstracts (American Chemical Society) || CAB Abstracts (Produced by CABI) || Accredited by NAAS-India(Rating : 6.79) || Current Contents || Chemistry Citation Index || Connect Journals || UGC Approved / Refereed Journal || Approved in EBSCOhost. Online FREE with Print Subscription.